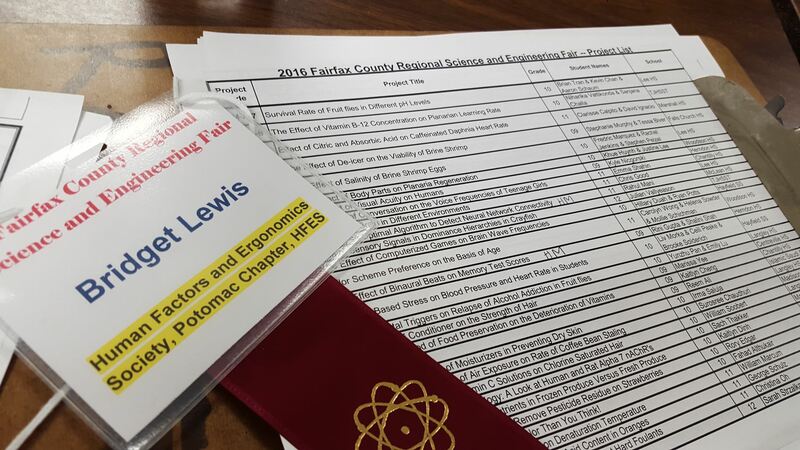 This year, we once again participated as organization judges for the FCPS Science and Engineering Fair. As expected, the projects were outstanding in all aspects, creative, clever and well presented. A hearty congratulations to all the students who participate this year! On Saturday, April 11th students from the George Mason University Human Factors program participated in the first ever Usabilathon, co-sponsored by the HFES Potomac Chapter. Teams of students competed to deliver the best possible usability analysis. The Outstanding Team Performance Award went to the “Green Team” for their innovative and thorough incorporation of human factors and usability principles into the redesign of an employee on-boarding system. Please see http://usabilathon.com/ for more information. Friday, March 20th, some of our outstanding members volunteered as judges for the FCPS Science and Engineering Fair. The students presenting were outstandingly clever and creative and it was an intensely difficult decision to decide winners. However, the winners and honorable mentions given out by the HFES Potomac Chapter are below. Congratulations to the all who participated! Please see the Event Slideshow for some pictures of the event. Honorable Mentions: Allison Brown for The Effect of the Order in Which Several Components are Listed on the Overall Desirability of the List as a Whole, Arden Titus for the Effect of Key and Tempo on Song Popularity, Annie Abraham for Neural Correlates of Gesture Comprehension in Natural Communication and Pooja Chandrashekar for Towards Rapid Diagnosis of Mild Traumatic Brain Injury.